This excursion offers the unique, rare and exclusive opportunity to visit the Island of Montserrat and observe close up and in total safety, the active Soufrière Hills volcano. We leave St. John's by coach and soon reach the heliport. Here we board our helicopter and head for the Island of Montserrat. The name of this place, which was a British colony until 1967, was given by Christopher Columbus in 1493 and derives from a mountain near Barcelona, in Spain, where the Monastery of Montserrat is located. 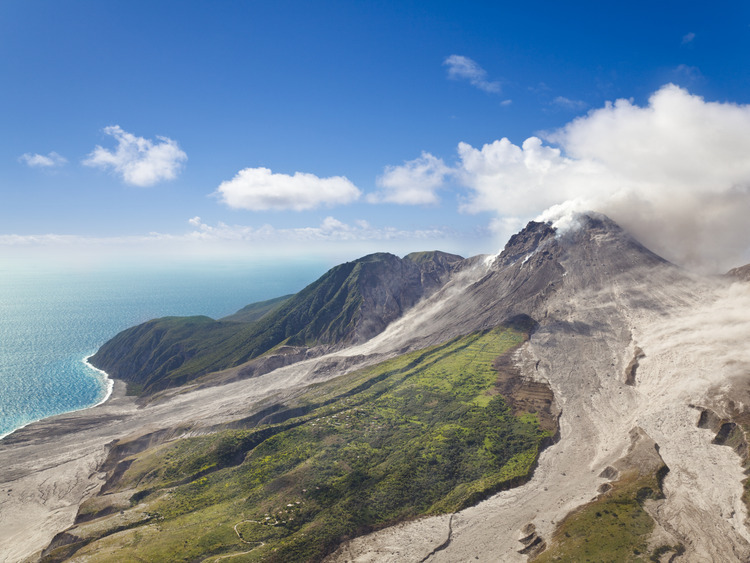 Tragically, the island was devastated by the eruption of the Soufrière Hills Volcano. Having remained dormant for a long time, in 1995 the 914-metre high volcano erupted, forcing two thirds of the population to abandon the southern part of the island and consequently even the capital, Plymouth. For this reason, there is an "Exclusion Zone that covers the whole south-eastern half of the island extending to about two miles from the coast. In the 80 sq. km of the "Exclusion Zone" all means of transport are prohibited and nobody is allowed to live there. For this reason, the only way to observe close up the puffs of ash, smoke and steam emitted by the volcano is by helicopter. During the flight, with a running commentary from the pilot, we also see the remains of the villages that were devastated by the eruption and the ruins of Plymouth, now uninhabited and partly buried under 12 metres of ash. This is undoubtedly a rare and very moving experience. Finding yourself in front of such dramatic evidence of the force of Nature cannot fail to amaze you and make you reflect. The pilot will provide information in English. The itinerary may be subject to change depending on weather conditions and volcanic activity. The flight lasts approximately 45 minutes. The coach transfer to the helipad takes approximately 10 minutes. To participate in the excursion, you must have your passport with you and go through customs in both Antigua and Montserrat.